Very Large Kutani Porcelain Figure of a Sage, mid- 20th Century. A studio piece featuring Opal White glaze robes, head piece, and beard with fine details, holding a staff and scroll, with a beautiful expressive face representing Jurojin, the God of Longevity and Wisdom. Signed. Height: 19 inches, 48 cm. Very rare and extremely large Japanese Blue and White Kutani Porcelain Sculpture of Kannon, the Goddess of Mercy and Compassion. High quality porcelain with beautiful blue glazing. It has very dynamically painted phoenix and other images beautifully painted as part of a fine composition. She is presented in a spiritual and graceful pose. Her face has a beautiful serenity filled with compassion. A beautiful work of art from all angles. Excellent condition with no chips, cracks, hairlines, or flaws. The mark on the bottom reads 'Kutani Kikusenon'. Height: 22 inches, 56 cm. A rare Japanese Fushimi clay sculpture of a Sino-Japanese War soldier. Fushimi Clay Dolls were painted dolls made of unglazed ceramic that were sold in front of the gate to Kyoto's Fushimi Inari Shrine, starting in the 16th Century at the end of the Momoyama period. They are also called Fukakusa Dolls or Inari Dolls. A charming example of Japanese folk art of the Meiji Period. An important find for the folk art collector. 9.25 inches, 23.5 cm. A rare Japanese Fushimi clay sculpture of a Sino-Japanese War soldier. Fushimi Clay Dolls were painted dolls made of unglazed ceramic that were sold in front of the gate to Kyoto's Fushimi Inari Shrine, starting in the 16th Century at the end of the Momoyama period. They are also called Fukakusa Dolls or Inari Dolls. A charming example of Japanese folk art of the Meiji Period. An important find for the folk art collector. 10 inches, 25.5 cm. 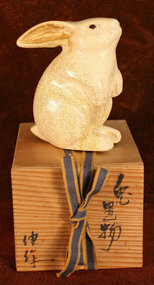 Taisho Period Japanese Ceramic Rabbit Figure, with original artist signed box. A charming studio work of art with wonderful glazes creating a striking image. 6 inches, 15cm. 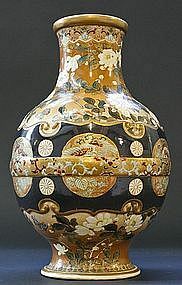 Japanese Satsuma Phoenix Vase by Kinkozan V, an important and renowned Satsuma artist. 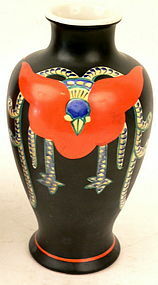 It features a stylized phoenix of under glaze red, yellow, green, and blue on a rich black ground. This kind of design was very influential on Art Deco. 9 inches, 23 cm. 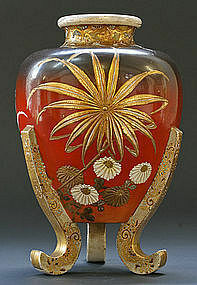 Japanese Satsuma Phoenix Vase by Kinkozan V, an important and renowned Satsuma artist. 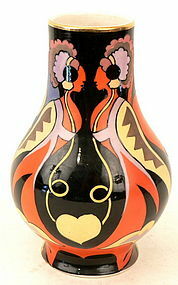 It features stylized figures and flowers in under glaze red, yellow, green and blue on a rich black ground. This kind of design was very influential on Art Deco. 9 inches, 23 cm. 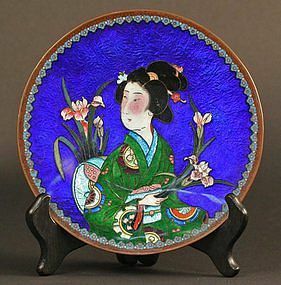 Large Meiji Period (circa 1900) Japanese Arita Porcelain Charger. Blue and white with gold accents, featuring an elegant stylized landscape and using sticking glazes to create a wonderful work of art. 16 inches, 41cm. From a widely renowned and published collection that has been exhibited at the Metropolitan Museum and Japan Society. Pristine Condition. A signed classic Kakiemon Japanese Porcelain Vase by Meiji Period artist, Ucho, featuring a wonderful flower image with gorgeous, brilliant under glaze red on pure white glaze. This vase has the wonderful global shape of perfection. 8.5 inches (21.5 cm) tall. Excellent Condition. From a prominent and widely exhibited collection. A Splendid Meiji Period Kyo Satsuma Vase with overglaze enamel decoration by the very well known potter, Taizan Yohei IX, and one of the Meiji Period's foremost painters, Kono Bairei. cf. 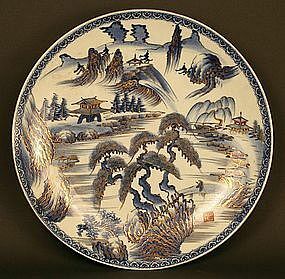 Meiji Ceramics by Giesela Jahn, page 157, figure 81. Taizan was a renowned Kyoto potter who exhibited and won prizes at a number of international events, including the 1893 Chicago World Expo. This is a very good example from a great potter of the Meiji Period, with auspicious symbols of Sparrows, Foliage, and Gourds beautifully composed on a yellow orca field with raised gold accents, the choice of colors and wireless technique enhancing its mystical feeling. 10.5 inches (27cm)h. From a widely renowned and published collection that has been exhibited at the Metropolitan Museum and Japan Society. 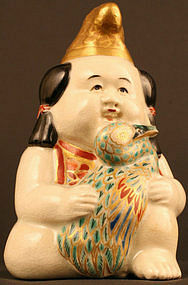 19th Century Japanese Porcelain figure of Kintaro in court attire in the style of a Gosho Ningyo (Palace Doll) holding a Crane. Kintaro loved all birds and animals. This rare porcelain figure is signed by Makuzu, a well recognized porcelain artist who is collected by museums and collectors in Japan. He uses glazes in his own recognizable style. 4 inches, 10 cm tall. Excellent Condition. From a prominent and widely exhibited collection. A very important find and a great day for the serious Satsuma collector who acquires this exceedingly rare pair of plates of breathtaking beauty, detail and color by the renowned Satsuma Master, Ryozan, depicting the two Goddesses of the Seven Lucky Gods, Benzai-ten and Kichijo-ten (Kichijo-ten sometimes replaces Fukurokuju in portrayals of the Seven Lucky Gods). These Goddesses of Good Luck, Happiness, and Learning are patrons of geisha and artists and are venerated by speculators, entrepreneurs and tradesmen who pray for luck in business and love. This is a one-of-a-kind portrayal and format by Ryozan, one of the foremost Satsuma artists of 19th Century Japan. 9 inches, 23 cm. Excellent Condition. 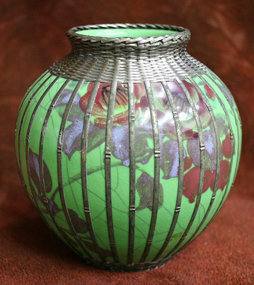 A spectacular Meiji Period Satsuma vase by Kinzan I. In 2001, the Kinzan kiln was designated a National treasure by the Japanese government. The Kinzan kiln pioneered and developed unique gilding techniques, such as underglaze gold leaf. 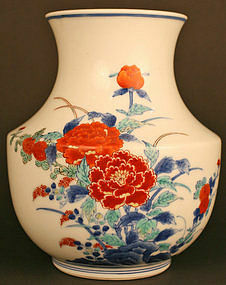 This rare vase is a wonderful example of Kinzan's mastery. Height: 10.5 inches (27cm), circumference: 21.75 inches ((55cm). 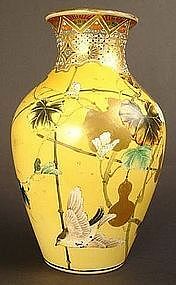 A beautiful Satsuma vase by Kinkozan, the foremost artist of the 'Golden Age' of Satsuma during the Meiji Period. In ovoid form with gorgeous relief butterfly and flower designs and a central band with floral rosettes on black. Kinkozan mark on base. Height: 12.5 inches, 31.5 cm; Circumference: 25 inches, 63.5 cm.